David Buenrostro, Adrian James, and Jahel Ramos protest outside the Obama campaign offices in Culver City, Calif., Thursday, June 14, 2012. 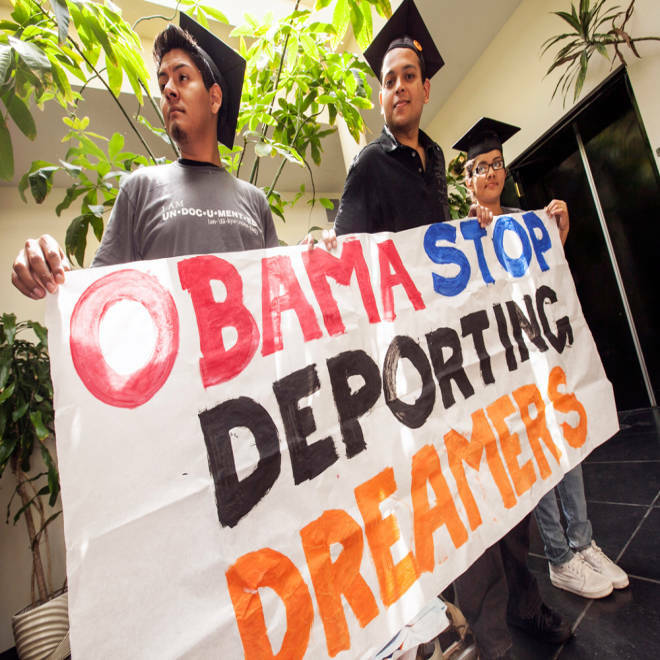 While some illegal immigrants and their advocates heralded the Obama administration’s announcement Friday that it would no longer seek the deportation of most undocumented youth, others expressed skepticism, saying it was a grab for Latino votes and wouldn’t make a big difference. Abdollahi spoke with msnbc.com from the Obama campaign office in Dearborn, Mich., which he says he and other protesters had shut down recently in an effort to force Obama’s hand on the issue. Young illegal immigrants also have been occupying such offices in Cincinnati, Ohio, and the California cities of Oakland and Los Angeles. Noting that they believed last year’s guidance to give prosecutorial discretion in deportation cases wasn’t helping illegal immigrants, Abdollahi said the new guidelines outlined in the government memorandum released Friday would not provide categorical relief for Dream Act-eligible youth and would be applied on a "case-by-case basis" by local offices who were "very set on deporting each and every one of us." The Department of Homeland Security announced that effective immediately the government would no longer seek the deportation of illegal immigrants who were brought to the United States as children and would allow them to apply for work permits if they meet certain criteria. A senior administration official said in a conference call with reporters that as many as 800,000 undocumented immigrants stand to benefit from this change. Homeland Security Secretary Janet Napolitano said the shift represented neither immunity nor amnesty -- buzzwords for conservatives who oppose illegal immigration -- but instead represented an instance of "prosecutorial discretion" in which the government had re-evaluated its priorities in enforcing the law. The announcement represented a major policy shift, and its political implications will be significant. “A lot of the work that dreamers have been doing … it’s showing fruit, so we’re a little bit shocked, a little surprised and definitely excited,” said Vargas, 28. The shift essentially accomplishes many of the legislative intentions of the DREAM Act, an immigration reform bill that had stalled in Congress due to Republican objections. President Obama favors the legislation, while presumptive Republican presidential nominee Mitt Romney has said he would veto that law. In the memorandum to immigration enforcement officials, the government said it would not pursue immigrants who met five criteria: those who came to the United States under the age of 16, are no older than 30, are currently enrolled in school, have graduated high school or served in the military, have been in the country for five continuous years, and have a clean criminal record. For Yelky Ramos, a 20-year-old recent college graduate who came from the Dominican Republic when she was 13, the change means she should be able to get a job. That will provide "great relief" to others like her, who have finished university, and provide an incentive to youth in high school, she said. “We just hope that the way they’re going to implement it is going to be fair to the undocumented youth and it won’t be a trap in which people will be applying for this type of deferral and then find themselves … (in) legal proceedings that might lead to deportation,” she said. The change won’t have an immediate impact on her parents since, who don’t have any status in the United States and are planning to return to the Dominican Republic. “They know that immigration reform is very far from happening here in the United States with this political arena,” she said. Chung-wha Hong, executive director of the New York Immigration Coalition, called the move an “amazing,” “historic” victory and said it would "lend huge momentum" to fixing the immigration system.